I have always admired fashion designer Eileen Fisher for her simple silhouettes and comfortable clothes and over many years have mentioned to countless other designers the genius of her marketing strategy: In her ads she was the first that I can recall to feature models of all ages, often in one photo. 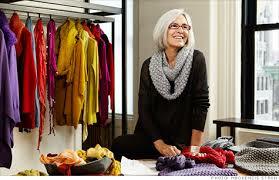 I didn’t know anything about Ms. Fisher until I read David Gelles’ article in The New York Times, “It Would Be Better Not to Call Eileen Fisher a Boss.” Her business approach is as smart and unusual as her using young, middle aged and old mannequins to show off her clothes and accessories. She sports the same hair color—white—as some of the women dressed in her fashions. She lived in a chaotic household as a child with nobody telling the kids what to do so having a boss in her first job at Burger King at 15 was “kind of strange for me” she told Gelles. She said she had an authority problem. In New York she started in interior design and when she went to Japan with her then Japanese partner and first saw the kimono she was “very intrigued by the way it moved…..I was fascinated by the idea that one design, one shape, could transcend time, and be made new just by different patterns and colors.” Her fashions revolve around eight basic pieces to which she adds or subtracts a few pieces every season. Her customers read The New York Times and The New Yorker, not Vogue. She started her fashion company with $350 in the bank, going by subway, carrying the pieces she cut on the floor of her loft in garbage bags to a factory in Queens. She sold those clothes–$40,000 worth– at a boutique show. Have you worked for an employer like this? Would you have fit in? Are you surprised at how successful this business is especially in the fashion world with a reputation for rough gruff souls and primadonnas galore?